Thanksgiving is a week away and we can’t wait to tuck into all the goodies—mashed potatoes drowning in gravy, whip-topped pumpkin pie, and don’t get us started on all the delicious Black Friday sales! If you’re playing hostess with the mostess this year, we know things can get crazy in the kitchen (a tip: Tastespotting is an absolute gem for recipes), which is why we’ve made a list of easy ways to entertain with style. Our tips are quick, chic and pack major punch, so guests leave with a lasting impression while you can focus your energy on more important things, like that big bird in the oven. 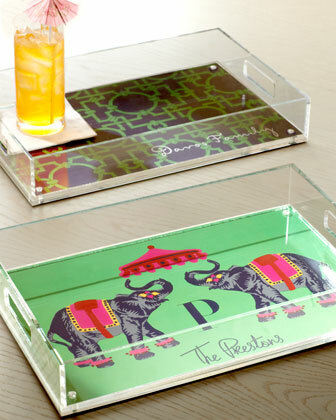 Greet friends & family with a très chic tray of cocktails as soon as they arrive to make them feel at ease. Iomoi makes these colorful Lucite confections (enjoy free shipping with code NMFALL) which you can personalize with your family’s name or initials. Skip fussy homemade appetizers and serve up light, ready-made bites to hold guests over till dinner. 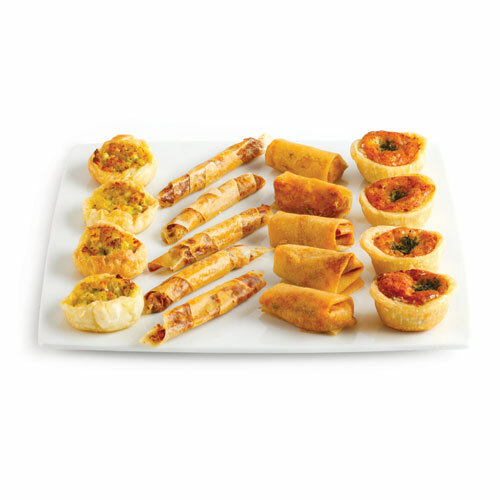 Dean & Deluca’s Classic Hors D’oeuvres collection includes a yummy mix of crowd favorites, such as crab cakes and mini quiches. They ship frozen overnight, so all you have to do is pop in the oven a few minutes before arrivals. Set a festive vibe with the perfect dinner playlist. 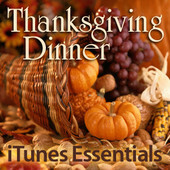 You can download ITunes’ Thanksgiving Dinner songs, which includes a warm mix of Michael Buble, Keith Urban and Bing Crosby. Don’t let side dishes get cold while your turkey hogs the oven. 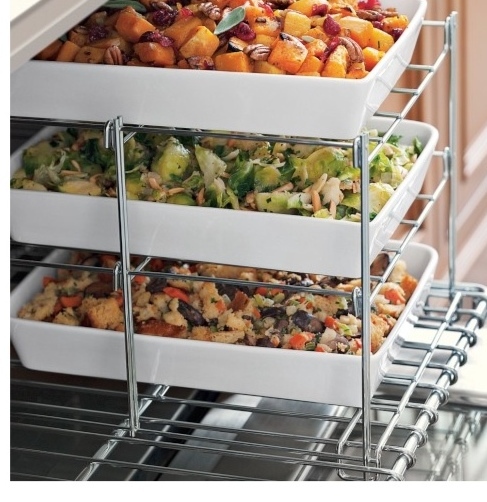 Williams-Sonoma’s three-tiered rack (save 15% on all tabletop items with code TABLETOP15) maximizes space so you can serve warm, fresh-from-the-oven fare come showtime. 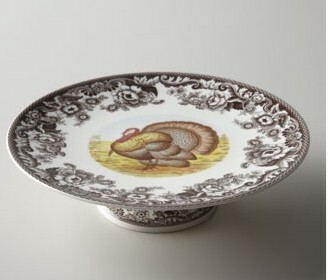 Put that pecan pie you slaved over on a pretty pedestal, such as this season-perfect turkey cakestand from Horchow (take an extra 30% off for Friends & Family), sure to spark conversation during the dessert course. Lastly, don’t forget to dress up—look perfectly polished while maximizing comfort in a fluid floor-length dress, such as this one by BCBG Runway (get free three-day shipping!). Colorblocking and pleats keep the look chic, while the relaxed fit and light-as-air fabric feels like you’re wearing pajamas. This entry was posted in Fashion, Home and tagged BCBG Adelaide dress, BCBG Runway, chic thanksgiving entertaining, dean & deluca, easy thanksgiving tips, Horchow, iomoi Lucite tray, ITunes, thanksgiving ideas, Thanksgiving music playlist, turkey cakestand, Williams-Sonoma oven rack by BIRDY GREY. Bookmark the permalink. I’m not sure which I like more, that dress or the three tiered oven wrack!